Sire: FOXHOUND: winning %-brother to Champion Wolfhound(Gr.1 Haydock Sprint, Gr.1 Prix de la Foret, Gr.3 Diadem Stakes, sire) andAl Multi (sire), from the immediate family of Champions and sires AP Indy, Summer Squall, Duke Of Marmalande, etc.). Sire of Kier Park, Mount Abu (Gr-1 Prix de la foret,Gr.3 Aupreme, stakes),Foxysox (Gr.2 Santa Barbara Handicap. Gr.2 Bayakoa Handicap, Gr.3 Senorita Stakes,Gr.3 Tuzla Handicap, Peruvian Chief (Achillies Stakes,£189,000).Steve&apos;s Champ(Gr.3 Polar Cup), Be Foxtrol,Best Light, The Jobber(£93,000), Newpark Lady, etc. 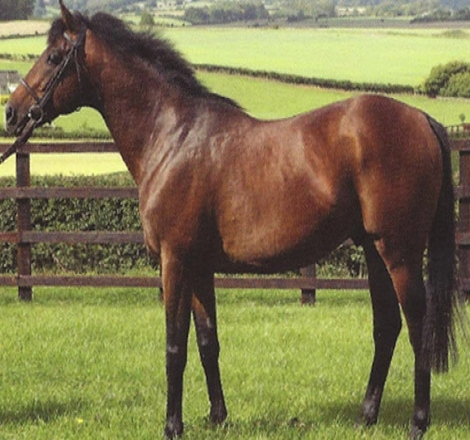 Dam: MERLANNAH:dam of 4 winners, incl Kier park,Perla Nrea (£81,000). Grandam: GET READY: won at 2 years; dam of 7 winners, incl:Anita�€�s Prince (Champion Sprinter: won Gr.3 King George Stakes, LR Goll&apos;s Stakes,LR Glenstal Stakes; 2nd Gr.1 King&apos;s Stand Stakes. 3rdGr.1 Prix de Pabbaye de Longchamp Stakes: successful sire), Ready: HKGr.3 Centurion Stakes, 2nd HK Gr.3Sha Tin Trphy): grandam ofBlue Iris (2nd LR Rous Stakes, 3rd LR Somerset Stakes:dam of Swiss Lake (LR St. Hugh&apos;s Stakes, 2ndGr.2 Flying Childers Stakes).Dubai Princess (2ndLRBosra Sham Stakes), grandam od Swiss Franc(2ndGr.2 Coventry Stakes, 3rdGr.2 July Stakes): 3rd dam of Ruby Rocket(LR Firth of Clyde Stakes), Alexander Alliance (LR Flame of Tara Stakes),Inzar&apos;s Best(LR Kronimus Rennen, 2nd Gr.3Prix Eclipsc), etc. KIER PARK won 3 races, £85,862, and was placed 15 times. Won Conditions race at Beverley, 5f, beating Rosselli(Gr.3),Bishops Court (Multiple Listed winner), Rudi's Pet(LR), Borders, etc. 2nd Conditions Stakes, 6f., Goodwood (to Invincible Spirit -Gr.1 winer & leading sire), beating Tamarisk (Gr.1). 3rd Gr.1 Prix Maurice de Gheest, 6% f, Deauville, (2%1 to King Charlemagne) beating Mount Abu (Gr.1),Minardi (Gr.1). Danger Over (Gr.3),Tertullian (Gr.3), Watching, Hot Tin Roof, etc. Anual Timeform: 107p at 2: 114 at 4.